Sometimes my laziness leads to some awesome meals. If I had my way, every day I would eat roasted vegetables with a handful of grains and a healthy dollop of hummus. All that needs done is tossing a few chopped vegetables in a roasting dish and waiting for roughly 30 minutes. This meal would fall into a similar category: toss everything together, place in the oven and forget it! 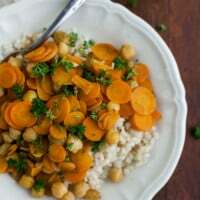 I think carrots are an underrated star in the kitchen and I’m always look for more ways to use them. The spices could be subbed out for your favorite (chipotle comes to mind) and I serve it over any grains I happen to have straggling in the refrigerator. This is up there as one of my new favorite gluten-free/vegan meals! 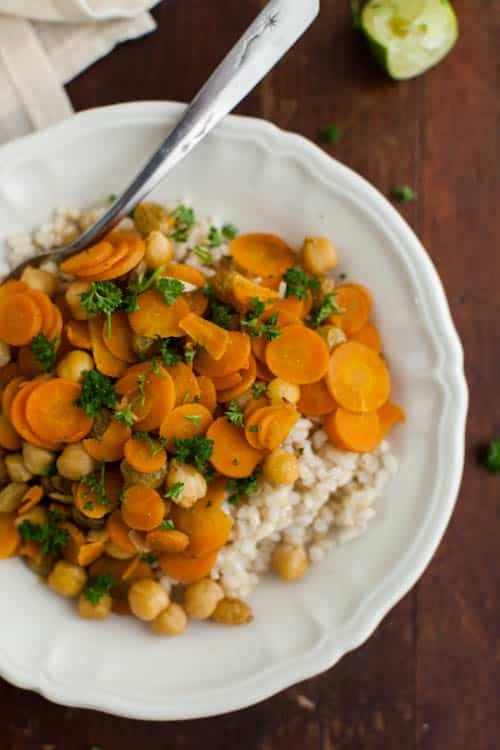 In a roasting pan, toss together sliced carrots, garlic, chickpeas, raisins, cumin, salt, and olive oil. Spread out into a thin layer. Add vegetable broth and cover roasting pan with foil. 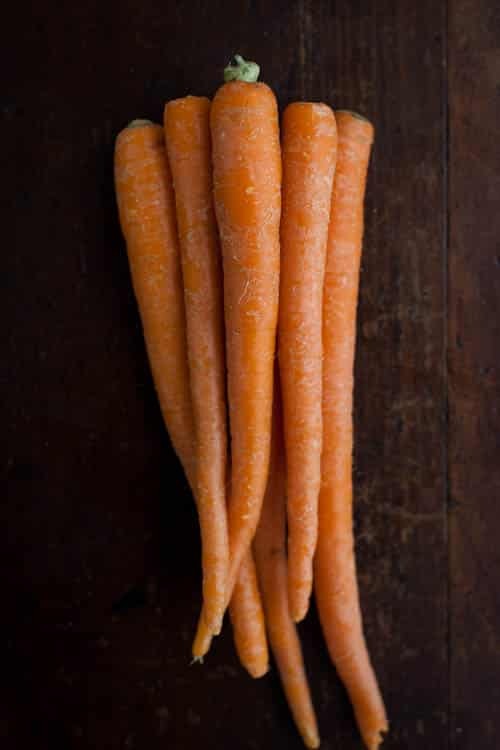 Bake carrots for 30 minutes, uncover, and then bake for another 10 minutes. Serve over cooked grains. I prefer to use whole cumin, toasted for 2-3 minutes, and then crushed with a spice grinder or mortar and pestle. If using pre-ground cumin, up to 1 1/2- 2 teaspoons if desired. Beautiful pictures. Will defo make this one soon. It’s so healthy. What kind of camera did you use? This is my kind of meal. I do the same things most nights of the week (roast whatever veggies are on hand + top over a type of grain). 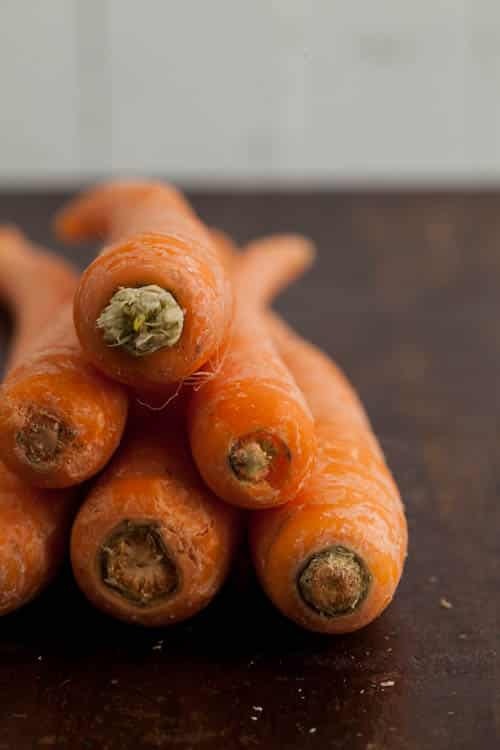 Carrots are my star player in the kitchen too – I’m totally obsessed. They hold up in almost all recipes and give a wonderfully bright texture and sweetness. I’ve made a similar recipe to this with chopped dates (instead of raisins) and a touch of honey at the end to bring out the sweet / savory combination. Your kinds of dinners are my kinds of dinners. I love how simple this is, and yet full of some of my favorite things. What a simple, colourful, and flavour packed meal =) Definitely going to try this one day! This is exactly the kind of food we’ve been eating for dinner this winter. 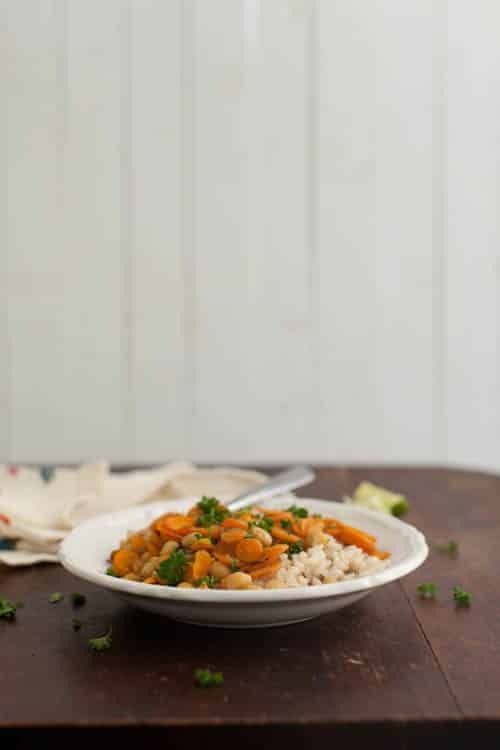 Simple, full of veg and beans, and hearty yes, yes, and yes. Delicious! You and I could live off the same meals. 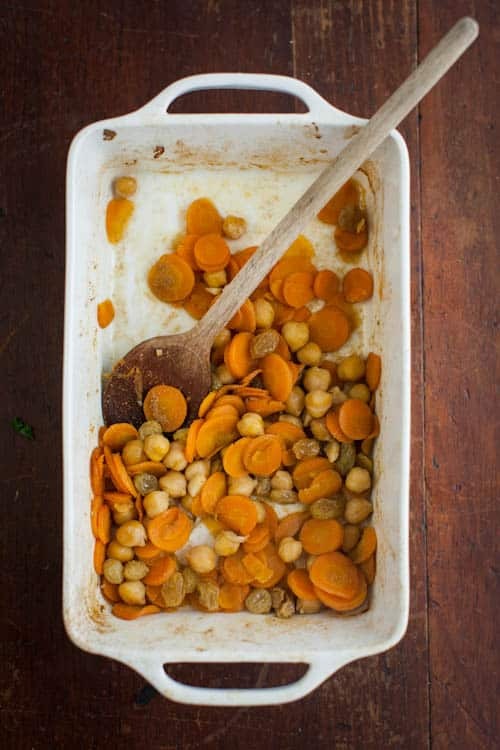 I love tossing a whole bunch of veggies + chickpeas in the oven and serving with grains or a tahini sauce of sorts. Yum! What a clever dish. I absolutely love the Moroccan spin with the cumin and raisins in this. And you’re right, Erin, this over rice is a perfect meal in a bowl! Love it! See, this is exactly the type of dinner I would make every night of the week but for The Linberg Chickpea Dispute. You know the one. HA! On the drive down to LA yesterday, my husband admitted he only likes hummus, not chickpeas. I looked at him and said, “oh, you’re one of THOSE people” 🙂 Sometime we’ll have lunch together and I’ll make us something loaded with chickpeas! 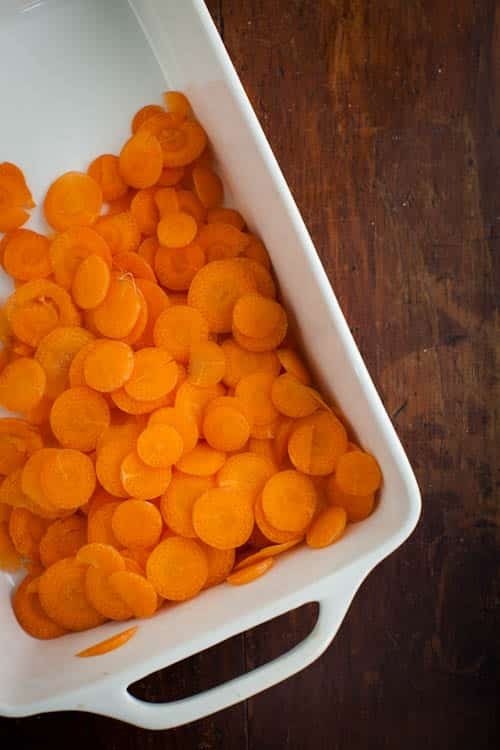 I am always looking for new ways to make carrots so I salute this recipe with so much happiness and respect! This has quickly become a favorite and a staple to our weeknight menu! We had this for dinner tonight over quinoa and it was SO good! Will definitely become a staple around here- so tasty and so easy. This was also the first recipe I’ve used my new mortar and pestle with- yay! 🙂 Thanks for the inspiration! I made this tonight and added half a beet, diced because I only had 2 carrots. Delicious! The braise-roast technique was new to me, but I really like the way it made the carrots super tender without being mushy.